Figurative language can sometimes be really confusing for students. This is especially true if English is not their first language. My students struggle every year with figurative language. Over the years, I introduced and practiced figurative language with them in many different ways. It’s actually one of my FAVORITE things to teach because you can incorporate songs and music, and picture books! I just love showing students all the places that they’ve heard figurative language and may not have even realized it! We always start out creating a flipbook to keep track of all of our learning about figurative language. You can make it yourself or you can grab the pre-made one that I created by clicking here. The first page is about the different types of figurative language. I like to expose them to all of the different types right away so they have that vocabulary to refer to as we proceed through the rest of the flipbook. The flipbook is so nice because we keep all of our learning in one place and it makes a great reference tool to refer to as they work with figurative language the rest of the year. Plus, I’ve included spaces for them to find examples in their own reading and add it to the flipbook. We mostly focus on onomatopoeia, alliteration, hyperbole, personification, simile, metaphor, and idiom. The way I first introduce this is by using the figurative language rap on Flocabulary. It does require a subscription but also has a free trial. They have a great rap that introduces the types of figurative language and then we record them in our flipbooks afterwards (as I don’t want them to add all of them to their book). They also have raps that are more specific to each type of figurative language that I use to introduce each type before we read each picture book. The kids love the songs! They are super catchy so they sing them even when they aren’t on and beg to have them played over and over. If you don’t have Flocabulary, there are tons of videos on YouTube that show how figurative language is in lots of songs. Just preview it before you show to your students as with any video you’d like to show them…believe me…I know from experience. There are lots of good videos out there but I found this YouTube video that hits all of the types of figurative language that I need it to. I just have the students sit, watch, listen, and think about how each matches what is being said in the lyrics. Also, you may want to preface it with letting them know that they don’t need to comment about each song and how they feel about it on a scale of one to ten. They are just examples to help them learn and understand. After the initial introduction, we read a picture book each day to dive deeper into each figurative language type’s meaning. Then we record examples for each one and their definitions. We also listen to the Flocabulary songs for each one, if available. Then as we’re reading the picture book, I have them write down examples that we hear throughout the book. I scaffold as we go through the book. I start out prompting them before we read the example, then I just stop after I read an example to see if anyone heard it, then I just read the rest and see how many they come up with. Then, afterwards, we review and those that missed some can add them to their flipbooks. 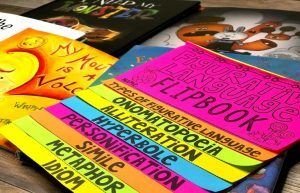 Many of the books feature more than one type of figurative language. If we’ve covered it already, we discuss and add to our examples on that page. If we haven’t covered it, then we just pass it up for now. After the examples and book, I have the students write their own example of that type of figurative language and draw a picture. DISCLOSURE: THE AMAZON LINKS PROVIDED WITHIN THIS POST ARE AFFILIATE LINKS. WHILE I DO EARN A SMALL COMMISSION BASED ON THE SALES OF THE ITEMS THEY DO NOT COST YOU ANY MORE. 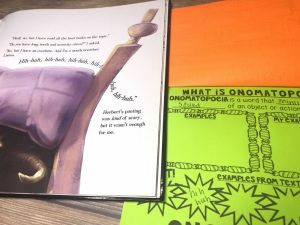 There are two books I like to use for introducing onomatopoeia…“I Need My Monster” by Amanda Noll and “Bedhead” by Margie Palatini. I mix it up each year as to which one I use or I use the other as a backup if they just don’t quite seem to understand it yet. Both books have a good amount of onomatopoeia examples in them. “I Need My Monster” is a cute story about a boy and the monster that lives under his bed and “Bedhead” is a funny story about a boy who wakes up with terrible bedhead. Another funny book that I LOVE which also has some onomatopoeia is “The Book With No Pictures” by B.J. Novak. Onomatopoeia is usually a pretty easy one for them to understand once you discuss the meaning and read the book. That’s why I start with it. I like to build up their confidence with with easier types of figurative language up to the harder types. Alliteration is usually pretty easy for them to grasp as well so we don’t spend a ton of time on it. I like to use poetry to introduce alliteration. Shel Silverstein is one of my favorites from childhood so I usually choose so I usually look for excuses to use him poems in my classroom. One of my favorite poems by him, “Sarah Cynthia Sylvia Stout” has tons of alliteration. It’s such a funny poem about what happens when Sarah will not take the garbage out and the kids usually really enjoy it. It’s in the poetry book, “Where the Sidewalk Ends” by Shel Silverstein. I like to display it on our interactive whiteboard and go through the poem finding all of the examples of alliteration. You can find the poem here if you don’t have the book. Hyperbole is usually a fun one for the students. They love coming up with their own examples. For Hyperbole, the picture book I like to use is “Parts” by Tedd Arnold. It’s a hilarious book where a boy thinks he’s falling apart because of all the normal things happening with his body. The kids always get a kick out of it. One example is that he thinks his stuffing is coming out because he found some lint in his belly button. 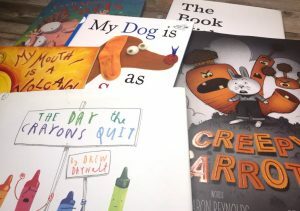 Two of my favorite books for introducing personification are “The Day the Crayons Quit” by Drew Daywalt and “Creepy Carrots” by Aaron Reynolds. “The Day the Crayons Quit” is a great story about a box of crayons who write letters to their owner letting him know how they feel about his coloring habits. I just love “Creepy Carrots” and even better if it’s around Halloween time but not necessary. “Creepy Carrots” is a cute story about a bunny who loves eating the carrots from a field until the carrots start following him around and CREEPING him out. Both stories are 100% personification. We start with these but then we also discuss some of the more challenging examples of personification throughout the year in other texts we read. For simile, I found this adorable book called, “My Dog is as Smelly as Dirty Socks” by Hanoch Piven about a girl who draws a family portrait and then uses similes to describe her family. It’s FILLED with tons of fun similes to record in our flipbooks. As we read, I like to discuss some of the similes and what they might mean. Similes can sometimes be more of a challenge for students. I also like to review that just because it has “like” or “as” doesn’t automatically make it a simile. It MUST compare two things. In the back of the book it helps them to write similes about their family members. We then use that to come up with our own example and picture for our flipbooks. For metaphor, I like to read, “My Mouth is a Volcano” by Julia Cook which is a fun book about a boy who has trouble controlling his volcano of a mouth. 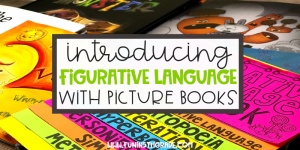 It has tons of other figurative language too which we discuss and add examples to those pages. By this point, we’ve gone through most of the types so I like to quiz them throughout this book to see if they can identify the type of figurative language on each page. There are two books I love that have tons of idioms; “Even More Parts” by Tedd Arnold and “In a Pickle: And Other Funny Idioms” by Marvin Terban. “Even More Parts” is the third book in a series from Tedd Arnold. In this one the boy in the story is freaking out about going outside. He is taking the idioms that people say and thinking about them literally. It’s a funny story and it makes a great discussion starter for each example of idioms in the book. “In a Pickle: And Other Funny Idioms” does a great job of going over exactly what an idiom is and explains the meaning behind MANY popular ones. 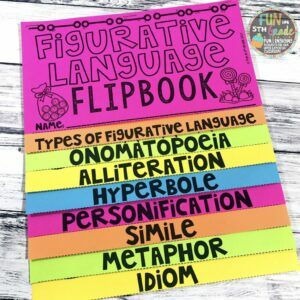 Once we have gone over each type of figurative language and the students have completed their flipbooks with examples they still have work to do. I have them get their flipbooks out during their independent reading time or during small groups, and they continue to add examples from their reading to their flipbooks. I also create a space in the classroom where students are invited to add some examples of figurative language that they hear in songs, conversation, tv, or radio. They add their examples to post its and they put their examples under the correct type of figurative language. They get SO EXCITED to come in and share their examples with me. Bonus: The flipbook is perfect to hold on to during station work, centers, or other work with figurative language. They refer back to it often. Now they are ready to play review games during center work that practice figurative language. One of my favorites is Figurative Language U-Know. They beg to play and even ask to take it to lunch and recess. I know. I can’t believe it either. It’s such great practice so they can keep their new knowledge fresh. 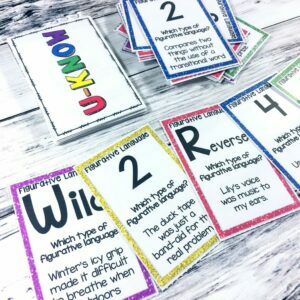 Check out the U-Know game here or check out this post to see how I use games to spiral the standards all year long. Let me know if you have any picture books you love for teaching figurative language that I missed. I LOVE adding to my ever-growing collection!